Allergy Advice: Contains Wheat, Soybean, Barley, Shrimp, Anchovy, Clam. May contain egg, milk and crustacean. Avoid direct sunlight and keep in a cool place. Keep refrigerated after opening. Ingredients: Red Pepper Paste (Corn Syrup, Wheat Flour, Red Pepper Powder, Salt, Wheat, Defatted Soybean Powder, Cooking Rice Wine, Koji (Barley)) (49%), Corn Syrup, Tomato Ketchup (Water, Tomato Paste, High Fructose Corn Syrup, Spirit Vinegar, Salt), Sugar, Onion Paste, Garlic, Red Pepper Powder, Pear Puree (Pear, Antioxidant (E300)), Cooking Rice Wine, Pineapple Puree, Salt, Water, Yeast Extract, Roasted Soybean Powder, Hydrolysed Wheat Protein, Seafood Extract Powder (Shrimp, Anchovy, Manila Clam). 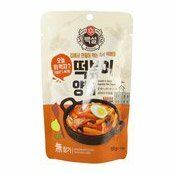 Simply enter your details below and we will send you an e-mail when “Korean Spicy Rice Cake Sauce (韓國甜辣年糕醬)” is back in stock!